Genevieve is a former intern from the dive department. She joined Aquarium divers in the Bahamas to help collect fish, under special permits, so that visitors in Boston can appreciate the splendor of a healthy Caribbean reef. After a top-to-bottom transformation, the Giant Ocean Tank is expected to reopen in early summer with some of the fish collected during this trip! After a rough crossing from Miami to the Bahamas, the group was eager to get in the water and start diving. We stopped at Rainbow Reef, a fairly shallow and easy dive sight. This was to be the only dive of the trip when we did not catch fish, but instead, focused on feeling comfortable in the water with our equipment and for those of us who do not dive regularly, it was a nice diving refresher. For our second dive at Rainbow Reef, we descended in groups of three or four and began chasing fish. 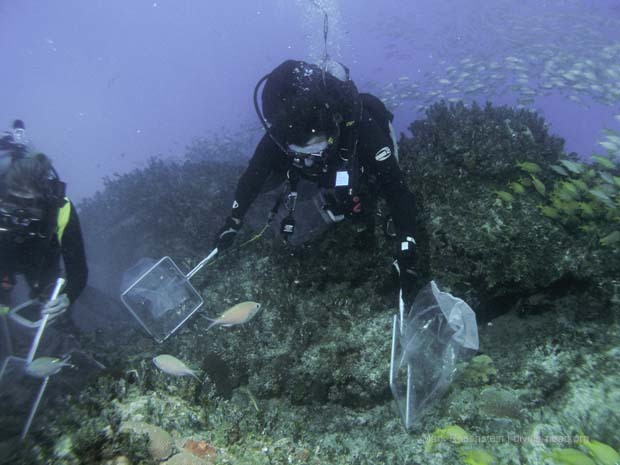 The majority of our group has collected before; either at the Aquarium during the process of draining the Giant Ocean Tank for the renovations or on previous collecting trips. I dove with Christine and Shannon, who work in Visitor Education, and Mari, the 2012 Dive co-op student. We chased a bonded pair of banded butterflyfish but since we only caught one, we released the fish back onto the reef. The Aquarium makes a point to keep bonded pairs intact; if we can’t catch both, we don’t catch either. Watch this pair of bonded pair of butterflies swimming in the GOT. Other groups had more success and we moved the first sixteen fish into the wells. All of the caught species were on the fish “wishlist”, so Sherrie, the trip leader and a Senior Aquarist for the Fishes Department, was happy with the variety in the size and color, since these are key characteristics for the inhabitants in the new Giant Ocean Tank. By showing visitors the beauty of a healthy Caribbean reef, we hope to inspire people to do what they can to protect these reefs and marine habitats around the world.